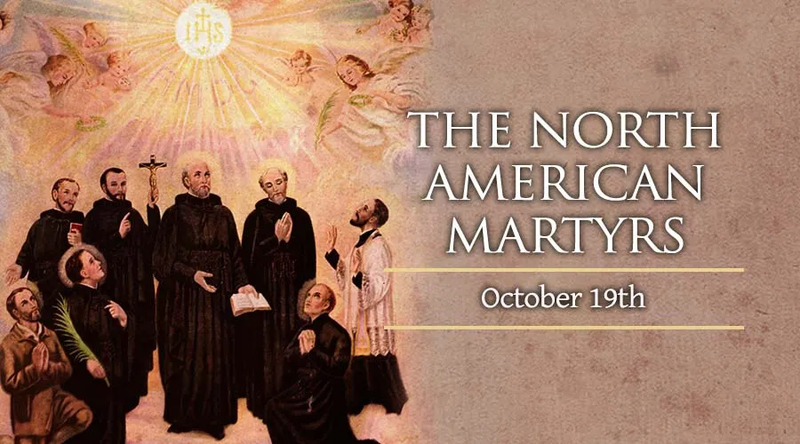 Also known as Canadian Martyrs; Isaac Jogues and Companions; Jesuit Martyrs of North America; Martyrs of New France. Saint Gabriel Lalemant, all priests, and all martyred in Canada in 1649. Saint Isaac Jogues, after thirteen months' imprisonment by the Mohawks, had several fingers cut off of his hand. He went back to Europe, but returned again to North America and was killed by tomahawk blows at Ossernenon, now called Auriesville, in New York State. Saint John de Brebeuf declared before he died, "I have a strong desire to suffer for Jesus Christ." He was tortured terribly, and a burning torch was put into his mouth, which strangled him. Saint Rene Goupil, thirty-five, was the youngest of the martyrs, and cried "Jesus, Jesus, Jesus!" as he died. Saint Noel Chabanel was thirty-six, and Saint Isaac Jogues and Saint Gabriel Lalemant were thirty-nine. The oldest of the eight North American martyrs, Saint John de Brebeuf, was fifty-six when the Indians killed him. They were canonized June 29 of 1930 by Pope Pius XI. Their memorial is October 19, and Spetember 26 in Canada.